When I was little, trains had always been a point of excitement. My dad is very fond of trains. We have always had a train layout set up in our home and every Christmas, a train runs around our Christmas tree. My dad use to drag my brothers along to see train shows that were held nearby. The go-to present for my dad remains either a box car or engine that he can add to his ever-growing collection. Upon departing for my semester abroad he even asked me to send photos of any cool trains I saw. This request led me to visit Train World in Brussels, Belgium during my independent travels. 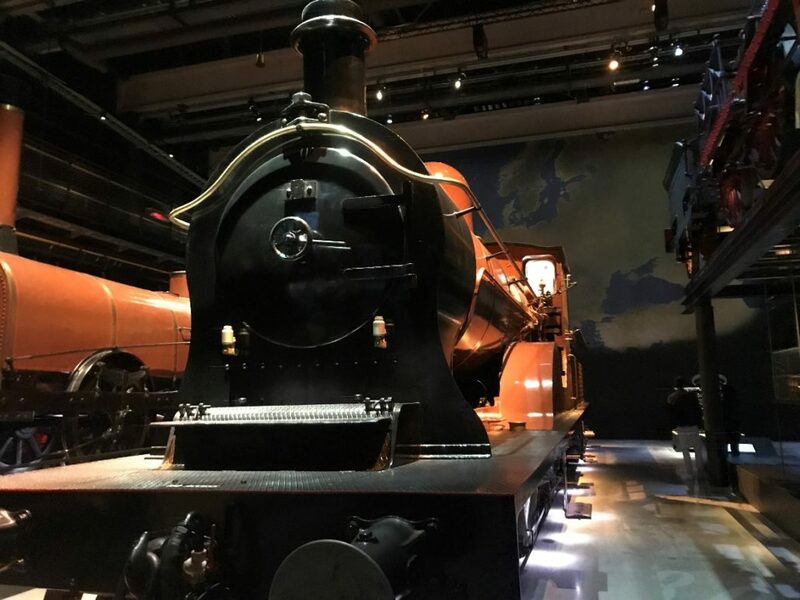 The museum contained a variety of memorabilia connected to the history of trains in Belgium and Europe. The museum was full of train engines as well as models of passenger compartments. 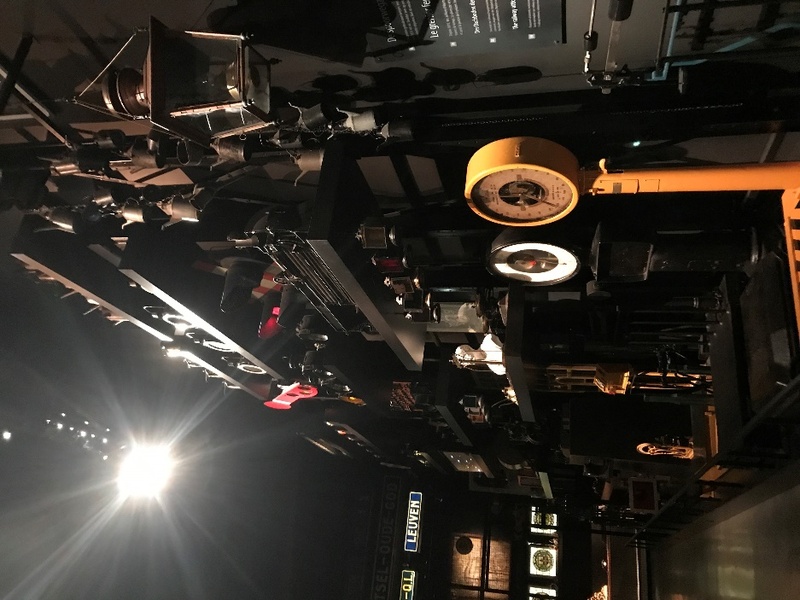 It traced the history of the development of train tracks and signaling systems as well as the transition from steam to electricity as methods of power for these massive machines. As I travelled through the museum, I thought about how my dad used to take my brothers to the Science Museum of Virginia to see the trains they kept outside. The museum experience brought back pleasant reminders of me as a little kid playing with the controls of model trains. In Hall 3 of the museum, something caught my eye though. Tucked away in a corner behind a wall was an exhibit I almost missed – a recreation of a cattle car. 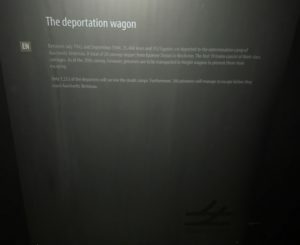 Labelled “The deportation wagon,” the installation served to commemorate the role of trains in the deportation of Jews, Roma, and other minorities during the Holocaust. 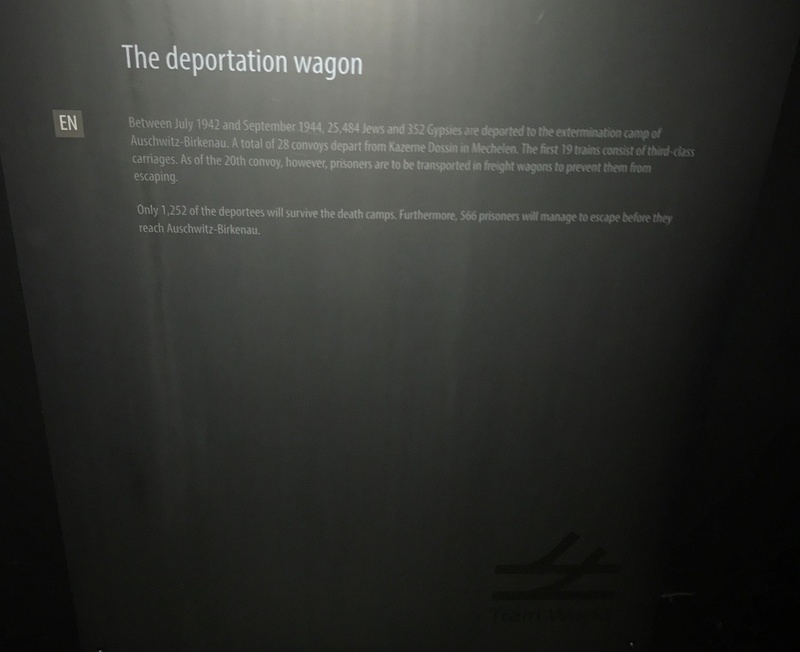 In the car, video footage played of Holocaust victims being deported via train within the car. Two signs were placed next to the wagon. One explaining the video and the other the number of trains that were deported from Belgium. The presence of the car was unexpected but also expected. 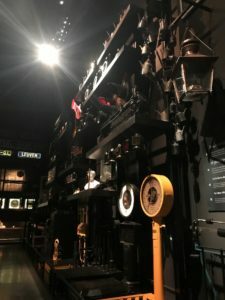 Upon entering the museum, I had wondered if there would be any sort of exhibit or acknowledgement in the museum of the role of trains during World War II. 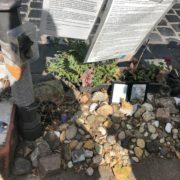 In the United States, I would never expect a train museum to have an exhibit on the Holocaust as the Holocaust is not connected with the history of the American railroads. The purpose of the museum was to tell the history of the trains in Europe. 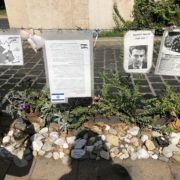 But then again it did seem to be a more lighthearted museum and the Holocaust may be something the museum wished to avoid speaking about in fear of darkness of the topic. 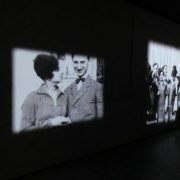 Upon reflection, it would have been a large misstep to not include the exhibit on the Holocaust within the museum. Trains played a vital role in making the slaughter of European minorities by the Nazis an efficient process. To not acknowledge this past would be poor portrayal of the history of trains. It would be an ignorant narrative. 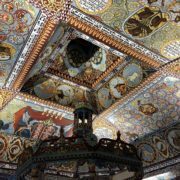 The museum demonstrates the very vivid the scar that the Holocaust as left on Europe and its history. 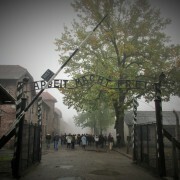 One cannot speak of the history of Europe without acknowledgment of the Holocaust. One cannot even discuss the history of trains without mentioning the Holocaust. These massive machines for which I have felt a feeling of excitement for also have a dark history that cannot be ignored. This size of the exhibit and its location within the museum begs a larger question regarding its appropriateness? The brief exhibit is hardly noticeable. I nearly missed it myself on my tour of the museum. I would not be surprised if most visitors missed it completely. Because of the gravity of the topic should it be in a more central location? Should it be more visible? While I think these are both arguments that can be made I think in this context, it would be unnecessary to make major changes. Better signage and visibility would be appropriate but it does not need to be a main attraction. While it is important to remember the past and use it as a source for future growth, there is still a need to move forward. I feel the exhibit plays well into the balance of honoring and remembering the past and its flaws as well as the ability to move forward. 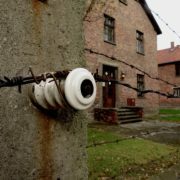 The museum accepts the role of trains within World War II and the Holocaust.